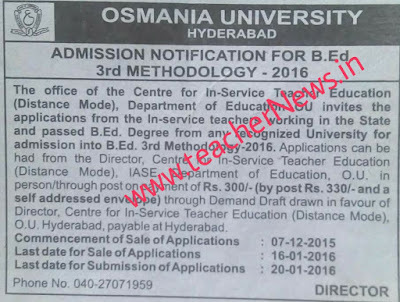 OU B.Ed Distance Education in Third Methodology Notification In Service Teachers B.Ed 3rd Methodology Admission 2016 Osmania University offered In service Teacher Education (Distance Mode) BEd 3rd Methodology course. 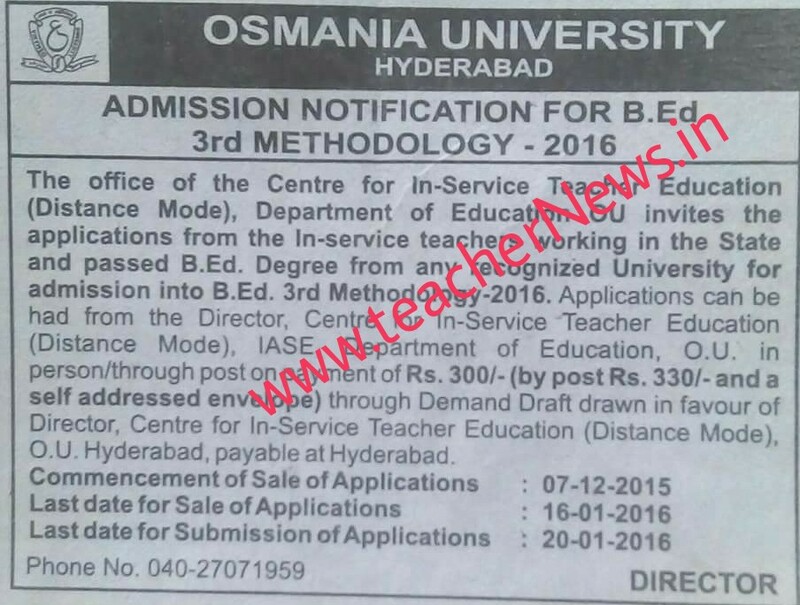 In service teachers working in the state and passed BEd Degree from any recognised University for admission in to BEd 3rd Methodology-2016 at http://oucde.net/. Applications can be had from the Director, Center for In service Teacher Education (Distance Mode) IASE, Deportment of Education O.U in person/through post on payment of Rs.300/-(by post Rs:330/- and a self Addressed envelope) through Demand Draft in favour of Director, Center for In service Teacher Education (Distance Mode) O.U ,Hyderabad,payable at Hyderabad. Commencement of Sale of Application: 07-12-2015. Last Date for sale of Application: 16-01-2016. Last Date for Submission of Applications: 20-01-2016.